NordECO decorative pillow covers magnifies the overall look and feel of your home, which are the perfect addition to your home. Designed in modern colors, these cushion covers suit both the minimalist tendencies of modern decors and the sophistication of traditional ones. Durable Material: made of 100% high quality polyster, soft and cozy, machine washable and easy to clean. Perfect Decoration: Modern styles of pattern is suitable for home, bedroom, room, office, coffee shop, etc. Hidden Zipper: The stitching is tight, the print is flawless, the zipper is hidden, gliding smoothly and allowing easy insertions and removals of pillows. Best Gift: To your friends, family and yourself in Mother's day, Christmas day and so on. 【New Arrival】When you purchase these pillow covers, you can get 30% off on super soft long fur throw blanket of same series. Just get the code from the below promotion part. 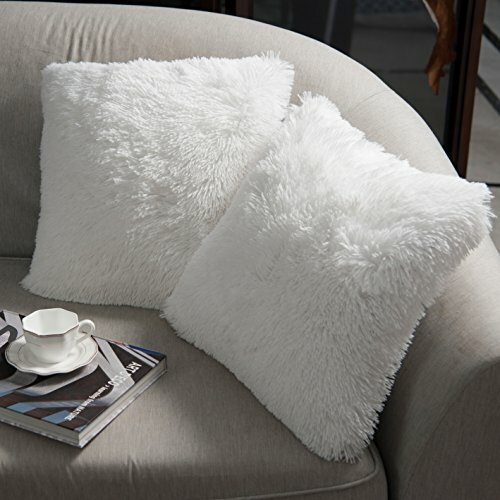 NordECO extra long faux fur creates elegant look, is ideal for your couch, sofa, bed, office chair and car. Made of 100% high quality polyster with cozy hand feeling, super soft and environmentally friendly. If you have any questions about this product by NordECO HOME, contact us by completing and submitting the form below. If you are looking for a specif part number, please include it with your message.